An essential first-step serum formulated with JAUM Balancing Complex assures a glowing and healthier look by harmonizing the balance of skin. 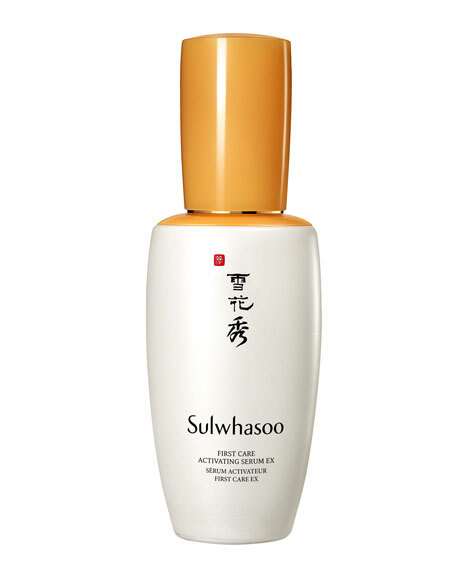 Hydrates and balances skin for a healthy and glowing look. Maximizing the effect of a complete skincare regimen. From over 3,000 Korean herbal ingredients found in ancient studies, just five were carefully chosen after countless trial and error, completing JAUM Balancing Complex through an 18-hour process of pure dedication. 180% more concentrated than before, the new JAUM Balancing Complex provides comprehensive skin care for beautiful balance. For dry skin caused by aging, the complex nourishes and firms the appearance of the complexion for healthier looking, glowing skin. Used as the first step after cleansing, the serum helps boost your next skincare product's absorption, usage, and results. It's suitable even for customers with delicate or sensitive skin. Use day and night after cleansing. Apply 2-3 pumps of First Care Activating Serum onto your palms and spread evenly across your face. Gently press palms on your face to help absorption. For in-store inquiries, use sku #1617182.